This section is dedicated to ideas and strategies relating to setting fields. Some of them are theoretical and used in practice scenarios, others have been suggested by other players and a lot of them are fields set by professionals in games I've watched and been able to figure where the players are set. 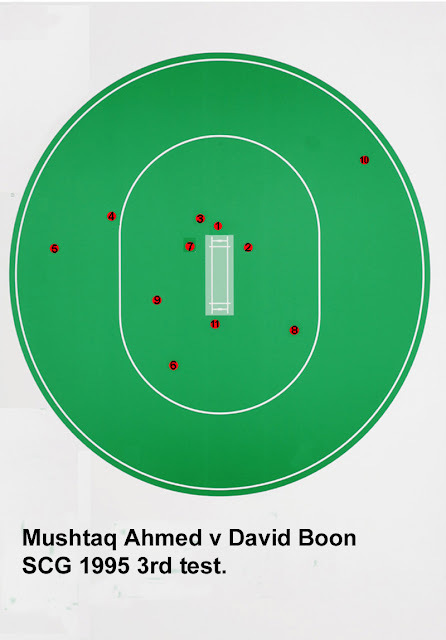 The bowling plans blog has got far more info on setting fields. 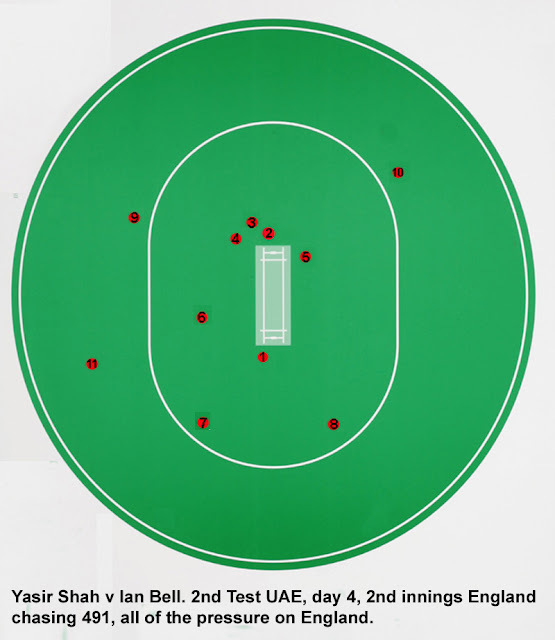 This field was set with England in a losing situation, so Shah was in a good position with support from the other end. England needed to score 491 with little hope of doing so. When we practice currently we do so on a cricket ground with an all weather strip. It's usually my younger son and I we're primarily bowlers, so we're tail-enders. In order to make the practice more worthy we set out a field using cones, so if the balls in the air and it goes anywhere near the cones it's deemed as being caught. Bowling today I noticed with my initial field which was split 50-50 legside and offside I was carted primarily over the legside. 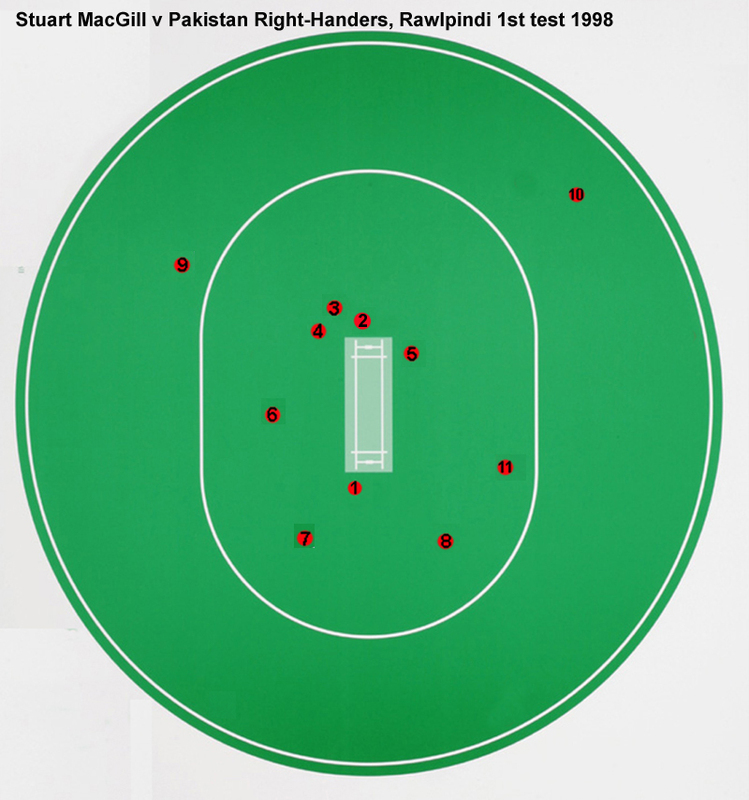 Realising that my son is far better hitting the ball through the legside I then considered 'Angry Ranga's' field posted on Big Cricket here and then came up with my only slightly less radical approach below... Using this field below I managed to get my younger son out 12 times in 46 balls only going for 20 runs or so, most of the dismissals would have been catches. 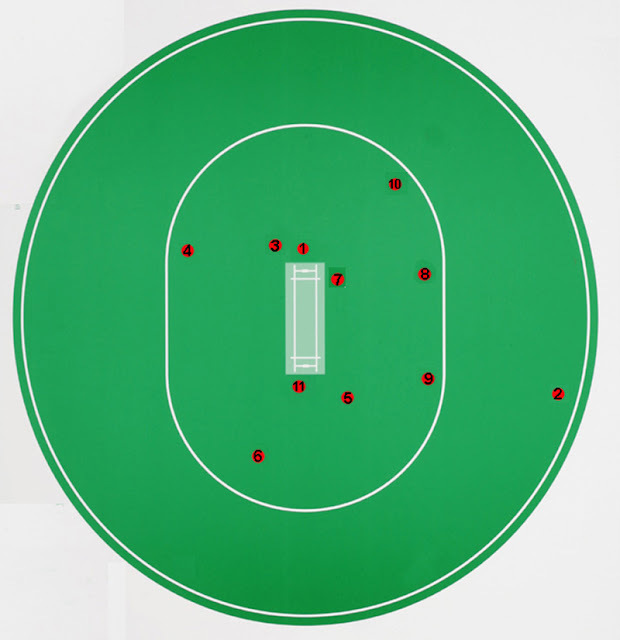 So this field may be an option against a tail ender like myself or my son who struggle to hit the ball easily through the off-side and rely on scoring runs on the leg-side. Double click the image for the video footage. From the same game, here’s the field setting for David Boon (Right-hander). Stuart MacGill v Pakistan (Right-Handers) Rawalpindi 1st Test 1998. Quite a tricky one to identify the positions of the players, but I reckon I've got it about right. Here's one for right arm finger spinners below, so maybe use full to Googly bowlers or Chinamen to consider? This was at a stage where Pakistan were in total control, so an aggressive field... There's a big gap at mid wicket.